The December Event takes place on Tuesday 13th December at 18:30. Location: The Portershed, Eyre Square, Galway. The event is in partnership with Computer Troubleshooters (main details below) and Powered by Bank of Ireland. All proceeds from the event will go directly to Western Alzheimers. Tickets Cost €5 each, this includes attendances and access to refreshments available i.e. Beer, Softdrinks, Mini Burgers and more thanks to our event sponsor, Computer Troubleshooters, Independent Brewery, and Handsome Burgers. 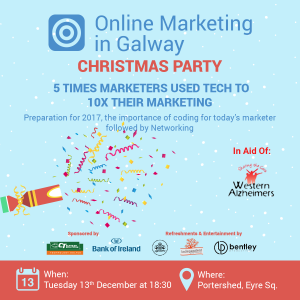 December Event Sponsor: Computer Troubleshooters, Galway. Managed by Enda Folan, Barna, Co. Galway. Event Partners: Bank of Ireland, Bentley Production, Handsome Burgers, Independent Brewery, Cantec Printers Galway, and The Portershed, Galway. Book here – seats are going fast!! BOOK YOUR SEAT FOR THE DECEMBER EVENT NOW! SPONSORS AND PARTNERS – OMIG 2016 – THANK YOU! Bank of Ireland has powered OMiG for 2016. We would like to take this time to thank them for all their assistance this year. Their contribution, along with others has helped us step up our offerings that bit more over the past 12 months. The larger events hosted by OMiG i.e. 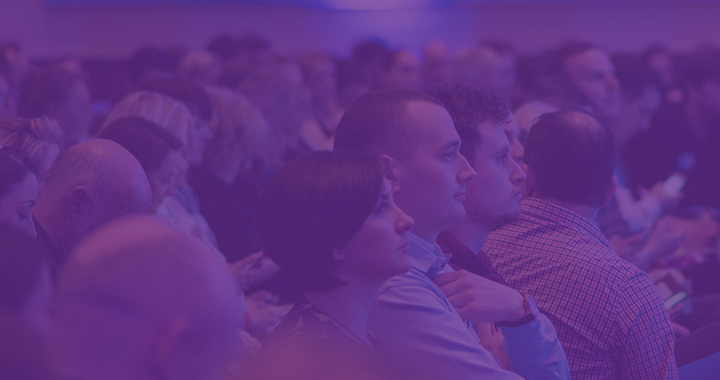 The OMiG Digital Marketing Summit and the OMiG Digital Marketing Awards are made possible thanks to a significant amount of resources (people, expertise, equipment, entertainment, refreshments and so much more) and budgets made available. The resources and funds provided to us are down to our volunteers, sponsors, and our partners throughout the year. We cannot let the year pass without a mention of our partners, platinum, gold & silver sponsors for our large events this year. The OMiG Summit and Awards were supported significantly by; Ireland West Airport Knock, Ireland Domain Registry, Local Enterprise Office, Galway, The Connacht Tribune, Blacknight, Bentley Productions, Cantec Print Galway, IMS Marketing and Altocloud. You can see all event sponsors if you look back at the blog post for the event via the events section of our blogs. Every contribution, both big and small makes a difference to OMiG. Sponsoring one of OMiG events, or sponsorship/partnerships for the year is completely affordable, in return, company and brands get real engagement, direct contact with attendees and an opportunity to support Galway’s ever growing business and tech eco-sytem. Use the code when purchasing tickets – OMIG17 – 50% off! Computer Troubleshooters / CT Business Solutions commenced operations in Galway in 2003. We meet a perceived and real need for quality Computer/IT/Cloud technical support in the growing IT user marketplace. We meet additional demands which require responsive call-out services to minimise office & systems downtime and deliver productivity solutions, technology and flexibility to our customers. In short, we are the “One-Stop Shop” ….Technology Solved! Our target markets are the Small-Medium Enterprises (SMEs), Small Office/Home Offices (SOHOs) and Schools, especially those without their own Computer & IT Support resources. “We are the IT department for small business”. Thanks again everyone, hope to see you at our December Event and Christmas Party. It promises to be a great night!